Where does CRI funding come from and what is its purpose? The Centers for Disease Control and Prevention (CDC) provides special Cities Readiness Initiative (CRI) funding for medical countermeasure distribution and dispensing planning to 72 regions throughout the nation. The primary goal of CRI is to support medical countermeasure distribution and dispensing (MCMDD) for all-hazards events, which includes the ability of jurisdictions to develop capabilities for "U.S. cities to response to a large-scale biological attack, with anthrax as the primary threat consideration." 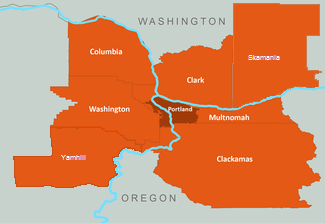 The Portland CRI Region is comprised of seven counties. It crosses two states and houses approximately 2.3 million people. The region includes metropolitan, suburban and rural areas, as well as "natural obstacles" such as rivers and hills, that add to the planning challenges. Clark County - Overview and contact information for Clark County Public Health planners. Clackamas County - Overview of Clackamas County County Public Health Emergency Preparedness. Columbia County - Learn more about the Public Health Foundation of Columbia County and their current projects. Multnomah County - Public Health Emergency Preparedness programs and information for Multnomah County. Washington County - Public Health and Personal Preparedness information for Washington County. Yamhill County - Emergency Preparedness resources at Yamhill County's Public Health Preparedness page.